Communities use the label "historic" to evoke a certain type of imagery or brand. In fact, these communities have many newly constructed buildings alongside older structures moved from other sites. Some seemingly "historic" structures were built new only a few years ago. These created antiques may be admired by the tourist who is lured by advertising, but Bridgeton has the real thing. Bridgeton's historic district, with approximately 2,200 residential, commercial, industrial and ecclesiastic structures is the state's largest. 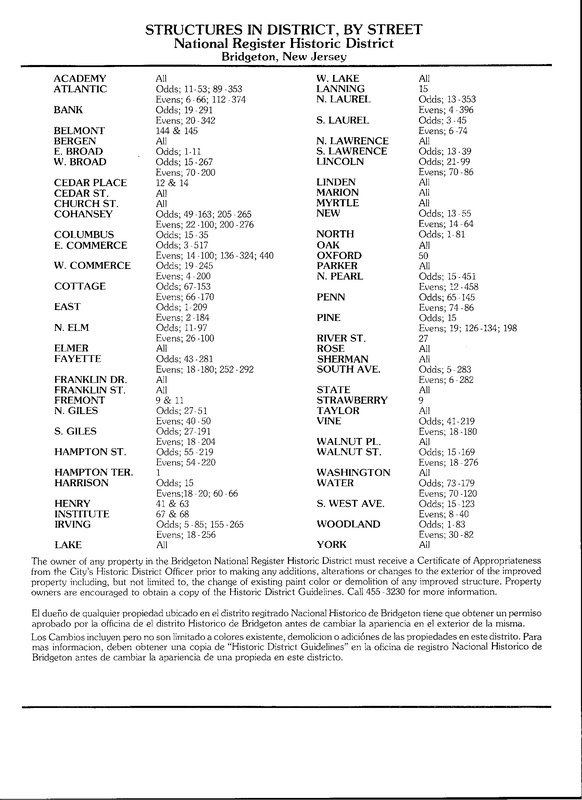 Initially inventoried in 1979; the Bridgeton Historic District was listed on the State Register on February 22, 1982, with listing on the National Register taking place shortly thereafter on October 29, 1982. That inventory includes examples of early American architecture that features hipped roofs and facades adorned with Palladian windows, columns, projecting pavilions. In addition to this Georgian style, Bridgeton features examples of the Federal style, the first genuinely American style to evolve from European influences, characterized by gable roofs and understated adornments; shuttered multi-paned wood sash windows and delicate façade details. Bridgeton was part of the Greek revival that swept the continent in the early 19th century. These influences can be seen in the columned porticos and gables adorning some structures. But perhaps the most prominent style was the Victorian style that became ascendant during the reign of Queen Victoria from 1837 to 1904. Traveling through Bridgeton today, one can see the remarkable gingerbread trim, board and batten siding, bay windows, and gabled dormers that characterize the Victorian style. Bridgeton, like so many smaller industrial communities around the nation, looked to capitalize on its assets as the manufacturing and industrial base that had defined the region shifted to the south or was outsourced overseas. With changing demographics and an altered fiscal landscape, Bridgeton continues to showcase the asset of its architecture as a way to develop its own brand. That process continues today as preservation minded citizens serve on Bridgeton's Historic District Commission and through other community organizations dedicated to educating homeowners in preservation techniques, translating guidelines into Spanish, identifying resources, and helping the historic district evolve in the 21st century.